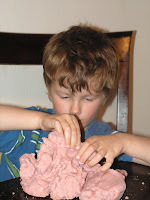 The Double Dipped Life: Play dough! Playdough is one of our favorite things. 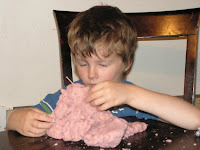 It is quick and easy to make, and the kids spend hours molding, cutting, and generally making a mess! 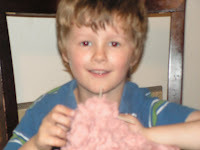 Now, not only is this time great for mom to get some things done, it helps the kids learn and grow as well! This is the best recipe for playdough. Now, I might be biased, since this is what I grew up playing with, but I've tried other recipes too. This one's the best! Mix these ingredients together in a medium sized pan. Mix wet ingredients in with the dry, and mix thoroughly. Heat the mixture on medium, stirring until it becomes a dough. I always remember my mom making play-doh for us when I was little it was great! Yep! 1/2 cup of salt! It's a good thing salt is cheap! You are right of course Heather! Thanks! I'm glad that you guys had fun with this!